Bullying is subject to statutory definition and where it is defined in statute, it would be that statute definition which would apply within the relevant jurisdiction. "Bullying means repeated and aggressive behaviour by a pupil where, (a) the behaviour is intended by the pupil to cause, or the pupil ought to know that the behaviour would be likely to cause, harm, fear or distress to another individual, including psychological harm or harm to the individual’s reputation, and (b) the behaviour occurs in a context where there is a real or perceived power imbalance between the pupil and the individual based on factors such as size, strength, age, intelligence, peer group power, economic status, social status, religion, ethnic origin, sexual orientation, family circumstances, gender, race, disability or the receipt of special education." "Bullying is typically a form of repeated, persistent, and aggressive behaviour directed at an individual or individuals that is intended to cause (or should be known to cause) fear and distress and/or harm to another person’s body, feelings, self-esteem, or reputation. Bullying occurs in a context where there is a real or perceived power imbalance.... 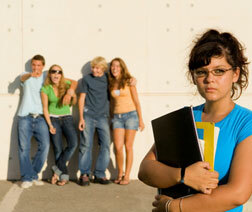 Bullying is a dynamic of unhealthy interaction that can take many forms. It can be physical (e.g., hitting, pushing, tripping), verbal (e.g., name calling, mocking, or making sexist, racist, or homophobic comments), or social (e.g., excluding others from a group, spreading gossip or rumours)." "Bullying (is) the repeated use by one or more students of a written, verbal or electronic expression or a physical act or gesture or any combination thereof, directed at a victim that: (i) causes physical or emotional harm to the victim or damage to the victim's property; (ii) places the victim in reasonable fear of harm to himself or of damage to his property; (iii) creates a hostile environment at school for the victim; (iv) infringes on the rights of the victim at school; or (v) materially and substantially disrupts the education process or the orderly operation of a school." "There is no magic in the term bullying. Any school has to have sensible disciplinary policies and procedures if it is to function properly as a school at all. It will no doubt take reasonable steps to prevent or deal with one-off acts of aggression between pupils and also recognise that persistent targeting of one pupil by others can cause lasting damage to the victim." "Bullying is not ... the occasional teasing or insults or even physical intimidation that all children encounter as they grow up.... Bullying, as the term is used by educational researchers, refers to an ongoing pattern of abuse that targets an individual and is sustained over weeks, months, or even years. It is cruel and inescapable, based generally upon a real or perceived imbalance of power. That imbalance may exist because the victim is outnumbered, is physically unable to confront the bully effectively, or is simply out-gunned in some other, less obvious way-for example, the bully may be highly popular and have the backing of enough friends to ensure that the victim can never gain the upper hand, even if the victim turns to adults for aid. The abuse is generally designed to humiliate and isolate the victim and to frighten and intimidate the victim and any well-meaning bystanders from doing anything about the aggression. It may take the form of verbal abuse, deliberate destruction of friendships the victim might otherwise have enjoyed, or physical intimidation and physical abuse. "Researchers have consistently and nearly universally found that seven to fifteen percent of children in elementary and secondary schools are victims of severe bullying. "Bullies are typically bright enough to keep their activities hidden from adults who might intervene. Bullies are not the insecure, unloved children that populate stereotypical notions of bullying. They are far more likely to be confident, popular and intelligent. They know how to turn the tables on victims who complain to school officials, and they know how to deflect blame even when they are caught victimizing another child. Their most important and widely shared characteristic is actually a lack of empathy." "Bullying can be both direct (such as face-to-face) and indirect (behind the back).... Indirect bullying is more difficult to recognize and respond to because the person being bullied may not be present when the bullying takes place. The primary purpose of indirect bullying is social exclusion or the damaging of a child's reputation or status within a peer group. Examples ... include spreading malicious rumours or gossip about a child, writing hurtful comments about a child, and/or encouraging others not to play with a child. "Girls have a greater tendency to take part in indirect bullying than boys." Hayward, John, Anti-cyber Bullying Statutes: Threat to Student Free-speech, 59 Clev. St. L. Rev. 85 (2011) [NOTE 1, see pages 87-88). Massachusetts General Laws (2011), Chapter 71, §37O. • Bullying image is used with permission - © godfer - Fotolia.com.